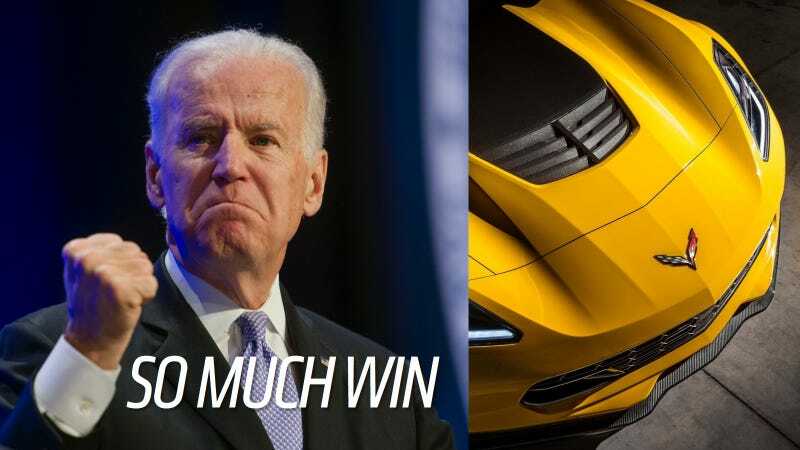 In further evidence that Chief American Gearhead Joe Biden is becoming indistinguishable from his Trans Am-loving persona in The Onion, the Vice President took time out of a speech to the UAW to stress one thing: how awesome the 2015 Corvette Z06 is. Speaking at a United Auto Workers conference in Washington today, Biden criticized right-leaning groups for what he described as their efforts to undermine labor unions. But he also talked about how much he loves the new Z06, a car he called "the best buy in America," and how badly he wants to drive one. The Veep even knows his performance numbers! "Everyone wants to know whether or not I'm going to run for president," Biden said. "There's a lot of reasons to run for president, but there's one overwhelming reason not to run for president. I'd like to get that Z06 with 0-60 in 3.4 seconds. 3.4 seconds!" "You tach that sucker up to six grand and this comes out of the hole like a bullet, man," Biden went on. Emphasis mine because OH MY GOD THAT IS AN ACTUAL THING THE VICE PRESIDENT OF AMERICA JUST SAID. Biden complained about being unable to drive — as other former White House residents have done, most recently Hillary Clinton — and said that if it weren't for the Secret Service he'd definitely be in a new Z06. "I still have my '67 Corvette. By the way, my grown sons had it rebuilt for me, and it cost seven times the sticker price, rebuilt. But it's a quarter horse, man. That's all it is, is a quarter horse," Biden said. "But that new Stingray, yoooo. Oh, it's more than a quarter horse, even though it goes 0-60 in 3.9 seconds — not that I like speed. It also can track on a curve. It has a 106.7 inch wheelbase. It has more weight in the back, for the first time ever. And I could hardly wait, if I were just not in this job, to take on my friend's Porsche." "Not that I like speed" was apparently delivered in a deadpan fashion, and based on Biden's penchant for driveway burnouts in his brother's CTS-V, no one would have believed him anyway. Come on, Secret Service. Let the man drive a Z06. For AMERICA. Hat tip to Thisisthemailiuseforcommenting on Oppo!